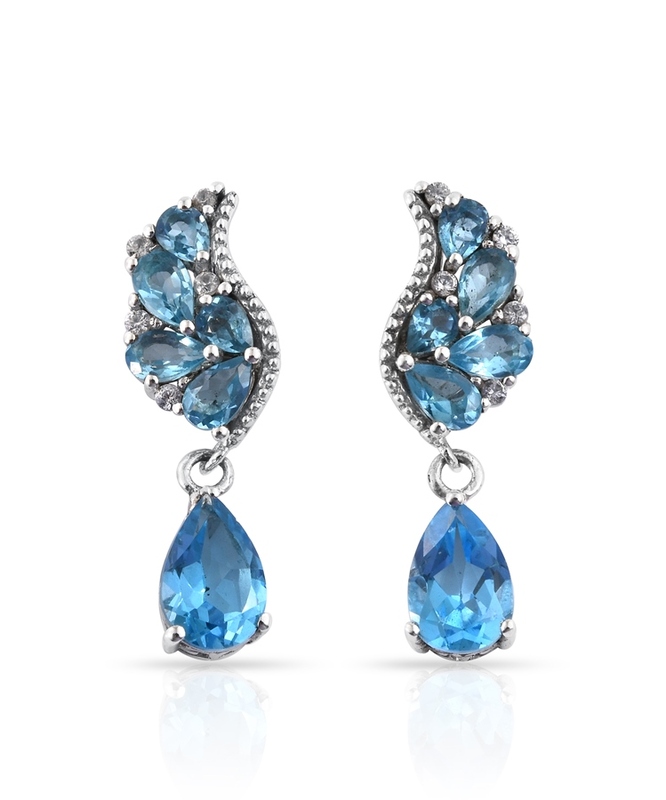 Marambaia topaz features exceedingly exceptional clarity, and an even and pure Swiss blue color. Topaz is an underappreciated and undervalued gem in modern times, but it is steadily making a comeback. Topaz is available in a variety of colors that have undergone bouts of popularity throughout history. Blue topazes are one of the most recent introductions to this family of gems. Marambaia topaz is often considered one of the highest quality among blue topazes, and the Swiss blue tones of this gem draw comparisons to high-quality aquamarines, such as Santa Maria aquamarine. Marambaia topaz is renowned for the clarity of finished material when compared to other topazes. Mined rough is initially colorless. Through heating or irradiation, a variety of blue tones can be introduced, ranging from delicate sky blues to medium Swiss blues through deep London blues. Shop LC proudly offers Marambaia topaz of the highly coveted Swiss blue variety. Once processed, cut, and polished, the faceted gems are remarkably eye clean. This means inclusions within the stone are not visible to the naked eye. Polished stones possess a sparkling luster that reflects like glass. Skilled cutters are needed to produce the best specimens, due to the stone's scarcity. 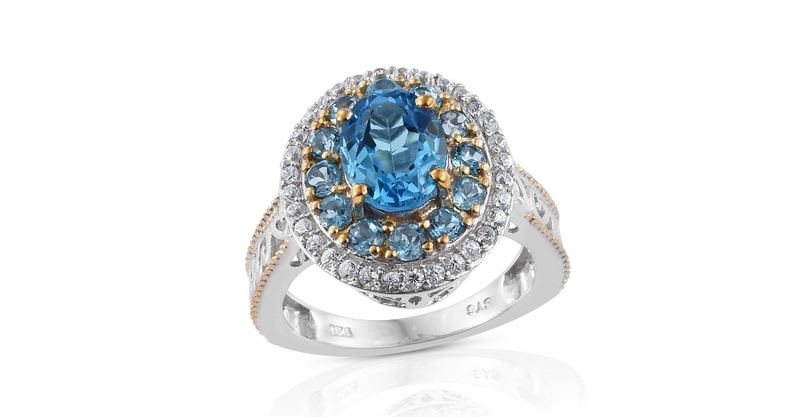 Topaz ranks eight on the Mohs scale, making it an ideal choice for daily wear. Its hardness puts it just below known gems like sapphire, ruby, and diamond. Considering this quality, topaz gems are perfect for any jewelry piece. 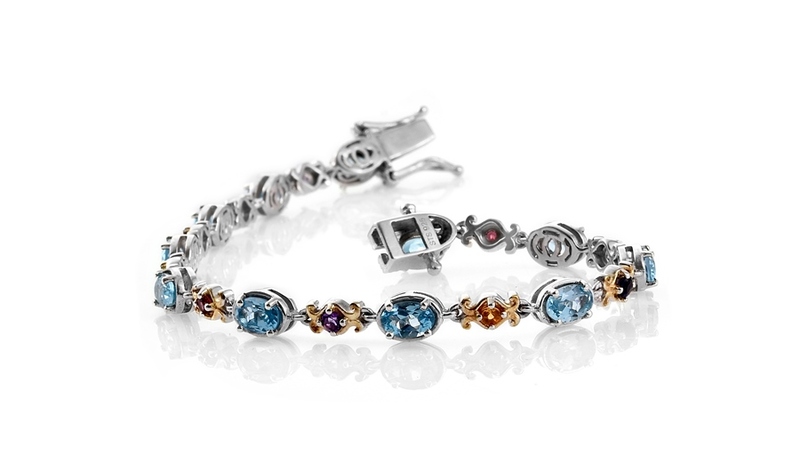 • Topaz and citrine are the modern birthstones for those born in November. Traditionally, topaz associated with November matches the yellow to orange-yellows of citrine. However, Marambaia topaz is an excellent alternative for anyone wishing to introduce a complementary color to transition from fall to winter. 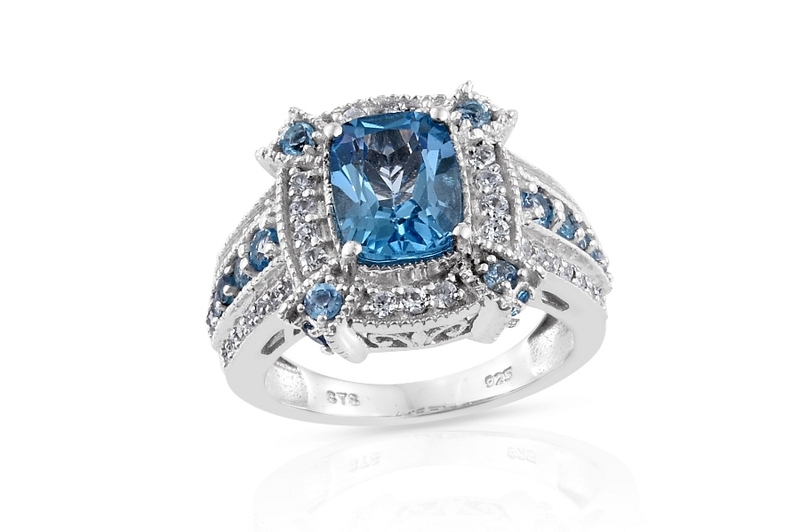 • Topaz is also associated with Sagittarians as their birthstone. Sagittarius, the Archer, is the tropical zodiac sign for those born between November 22nd and December 21st. • Marambaia topaz is named for the mine from which it's sourced. The word topaz, however, has more questionable roots. The Greek philosopher Pliny spoke of the legendary island Topazios. In Greek, the name means "to guess," as the island was reputed to constantly be under a shroud of fog. • The Sanskrit word topas means "fire," and this term is frequently attributed as the source of the modern word. It's especially plausible, as the topaz known in antiquity was yellow to orange in color. Topaz is a gemstone available worldwide. However, Brazilian material fetches a premium on the market for its quality. Among Brazilian sources, topaz from Marambaia is considered to be among the best to be found anywhere. 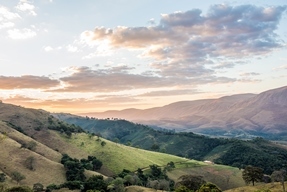 Within the Jequitinhonha Valley of Minas Gerais, Brazil is Marambaia Mine. Minas Gerais is world renowned for its production of minerals and gemstones, with each district notable for producing its own distinct stones. Marambaia Mine notably produces high-quality colorless topaz. Marambaia has been in gemstone production since the early 20th century. These topaz gems form within pegmatites. These are rocks, like granite, infused with gemstone crystals. The pegmatites found within Minas Gerais are estimated to be 490 million years old. Unfortunately, production of Marambaia topaz is inconsistent as miners are forced to follow seams of pegmatites as they hunt for these gems. This leads to occasional booms in mining with frequent dry spells in-between. Mining for topaz in Marambaia is a complicated affair. Aside from the previously mentioned periods of scarcity, rough is mined through a combination of mechanical and traditional methods. Larger open pits employ mechanical methods. Here, mined rocks are placed on conveyor belts. Trained workers will then carefully inspect the rocks as they pass through, separating promising deposits from plain stone. Like much of Brazil's mining industry, independent contractors are heavily relied upon for mining. Known as garimpeiros, these prospectors work hard to reach remote claims, supplying a sizable contribution of rough. Garimpeiros employ traditional tools and techniques in mining. Using picks, shovels, and wheelbarrows, they undergo backbreaking labor searching for topaz-bearing pegmatites. Collected ores are hand-washed and inspected for signs of topaz gems. Garimpeiros are valuable, thanks to their nomadic nature and ability to move to newer, more promising sites at the drop of a hat. Due to the difficulties of mining, and the scarcity of good-quality material, it can take over a year of continuous effort to supply enough rough material for a single Shop LC event. Sourced from the Marambaia Mine of Minas Gerais, Brazil. Color presents as a medium Swiss blue hue, with exceptional clarity. Heated or irradiated to induce color.